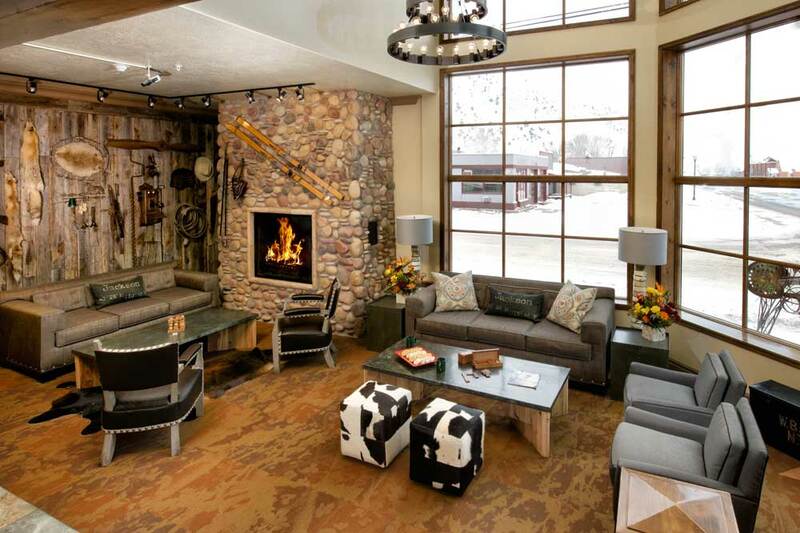 Your biggest challenge in coming to Jackson Hole is lodging. This is one of the world's most famous ski resorts, a hangout for the rich and famous. Most facilities here are expensive. But some are reasonable as long as you plan ahead and make reservations in September. We always like staying at the base of the slopes. We like the convenience. Skiing right to your door, or at least to your parking lot or courtyard, saves time waiting for shuttles and allows you to stop by the room for snacks, lunch, bathroom breaks, to get warm, or even for a brief nap. The other option is staying in the town of Jackson. (The valley is Jackson Hole, the town just Jackson.) This is not a bad idea. Jackson is one of America's great ski towns. Shuttles take you to and from the slopes, and there's a fine selection of restaurants. We do caution, however, that you must make reservations far in advance, preferably September. 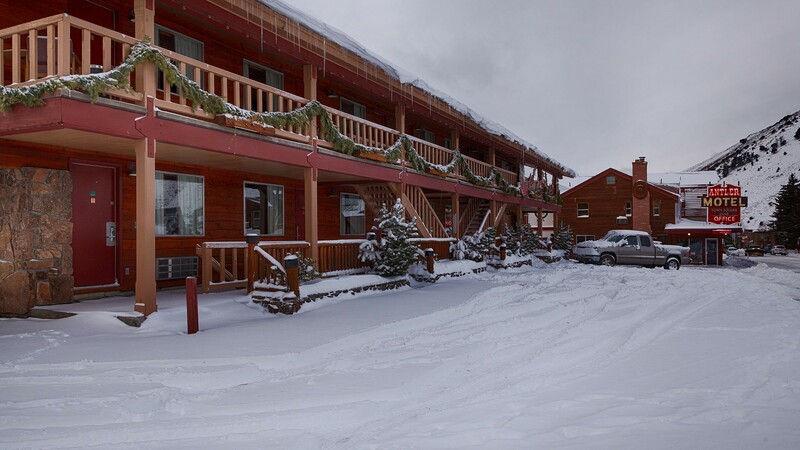 There is one affordable slopeside option we can recommend : The Hostel At Jackson Hole. This is not a typical hostel. They're usually very spartan, with shared rest rooms and dorm style beds. Not here. 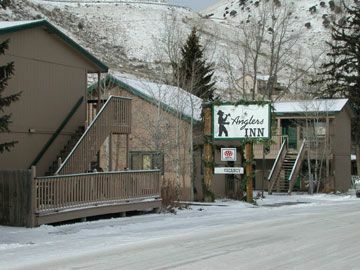 The Jackson Hole Hostel is a former motel, with individual rooms and private bathrooms. There's a game room (ping pong, chess, pool table, etc. ), communal kitchen (refrigerator, microwave, etc. 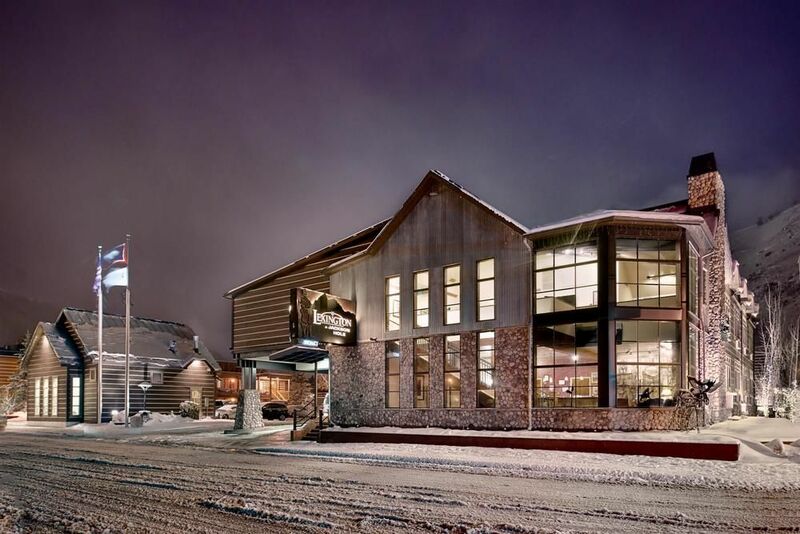 ), fireplace, ski prep room, and the gondola and chair lifts only steps away. Rooms contain either one king bed or four twins. There's free wifi. Either type of room costs $119 per night. There's a bus which continually circles between the town and the resort, so you can catch a $3 ride to shop, eat or stock up on groceries. The hostel offers laundry machines. Thin walls are noisy. The Mangy Moose next door serves hearty food which makes trips into town unnecessary. 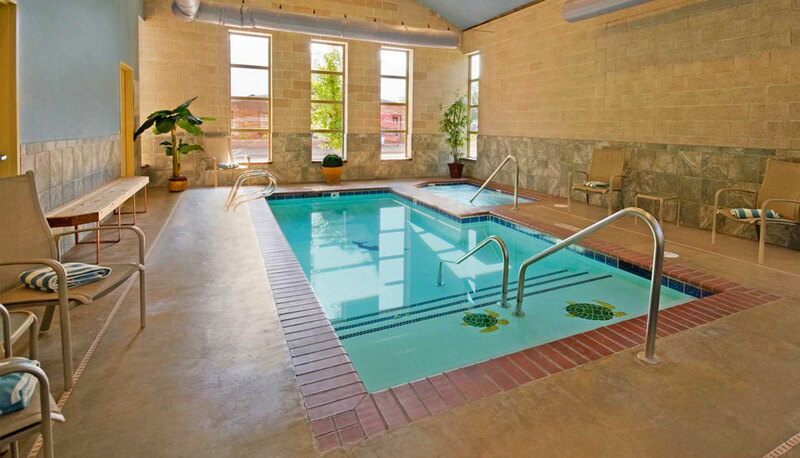 If you want a few more amenities, our first recommendation is The Lexington Lodge. It was built in 1970 by the Kudar family, which still runs it. The Lodge was totally renovated in 2012. Rooms were redone and 36 added. Heated tile floors, free wifi, Serta Perfect Sleeper mattresses and wide screen TVs were installed. The Lexington is a 1.5 blocks from the Jackson town square so is surrounded by restaurants and shops. Free shuttle service to and from the airport and slopes is provided. There's a free hot breakfast, indoor heated pool and hot tub, and refrigerator, Keurig coffee maker and microwave in every room. These complimentary breakfasts are not skimpy : they include eggs, biscuits & gravy, oatmeal, cereals, pastries, breads, belgian waffles, sausage, bacon and ham & cheese croissants. You can rent a basic double for $129 a night, but we've had readers report booking and paying in advance and only being charged $99 a night. Kitchenettes, fireplaces and sitting areas are available for slightly more. We like The Lexington so much the top two photos are also of this hotel. 307-733-2648. lexingtonhoteljacksonhole.com. Our second recommendation in town is The Antler Inn. It's just a block off the square and its shops and restaurants. The Antler Inn is one of four Jackson motels operated by Town Square Inns, so if you call for reservations and they're full they can move you to wherever they have vacancies. The Antler, updated in 2010, is very plush, especially for its low price point. It's one of Jackson's original 1950s motels, but it's been well run for over 60 years, especially through the long tenure of Clare Law, a powerful local woman who served seven terms in the Wyoming Legislature, was named Citizen of the Year, and is in the Wyoming Hall of Fame. You can book a basic double (below right) for $80 a night, or a fireplace room for $100. There's a pool/hot tub, free ski shuttle, free wifi, cable TV, refrigerators, fitness center, laundry facilities, coffee makers, flat panel TVs. 1-800-483-8667. townsquareinns.com. The least expensive deal in Jackson Hole is The Anglers Inn. Yes, you give up some amenities to get these low rates. The Anglers Inn is four blocks from the square, meaning a 5-10 minute walk to shops and restaurants. There is no free shuttle to the airport or ski slopes (meaning you have to use the Jackson bus, which runs to both but costs $3). There's no free breakfast. TVs are so tiny as to be unusable and the wifi is slow. Rooms and bathrooms are small. If you can tolerate these conditions, you get to pay $70-110 a night depending on whether you book a single queen bed, a queen plus pullout sofa, or two queens. However, this is not a low class motel. It's in a very nice neighborhood, backing up to Flat Creek. 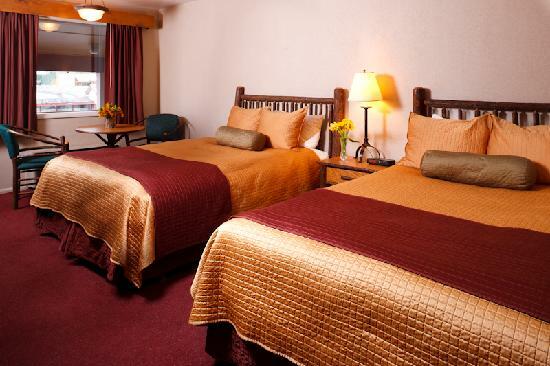 The 28 rooms have been updated and are very clean and comfortable. Rooms have refrigerators, microwaves and coffee makers. 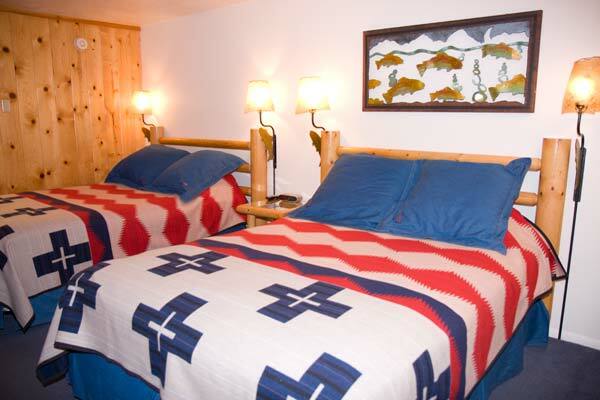 Beds are handmade from knotty pine and feature luxurious Pendleton blankets (above left). The Anglers Inn has been a fisherman's lodge since the 1950s and the decor shows it with paintings, lamps and other symbols of fish and fishermen. 1-800-867-4667. anglersinn.net.